Hveragerði is a town and municipality in the south of Iceland located 45 km to the east of Reykjavík on Iceland's main ringroad, Route 1. The river Varmá runs through the town. The surrounding area is part of the Hengill central volcano, and is geothermally active and experiences very frequent (usually minor) earthquakes. The town is known for its greenhouses, which are heated by hot water from volcanic hot springs. These springs are the site of occurrence of certain extremophile micro-organisms, that are capable of surviving in extremely hot environments. Close to the church is a hot spring called Sandhólshver, formed during the violent South Iceland earthquake of 1896. A fenced-off geothermal area in the town has numerous hot springs and fumaroles. Hveragerði contains a number of greenhouses and is a hotbed for Icelandic horticulture. To the south of Hveragerði, there is the small port of Þorlákshöfn, winter point of departure for the ferry to the Westman Islands. The local football club is Hamar, who play in Iceland's fourth tier. ^ "Climate Averages for Reykir í Ölfusi". Icelandic Meteorological Office. Retrieved 7 June 2016. 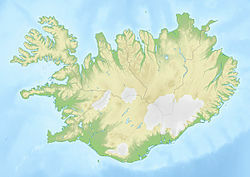 Wikimedia Commons has media related to Hveragerði. This page was last edited on 20 August 2018, at 01:28 (UTC).